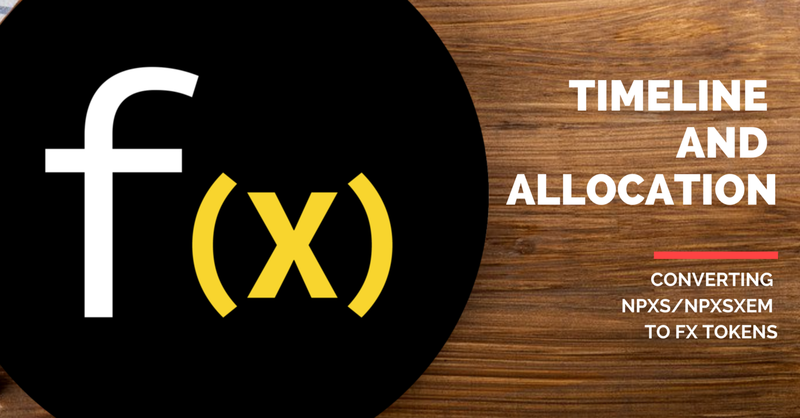 As previously announced, 45% of the total f(x) token generated from the token generation event will be allocated for converting NPXS/NPXSXEM to f(x) tokens. All the converted tokens will be removed from the NPXS/NPXSXEM total supply. In April, we will start to offer KYC-verified XWallet users who are interested in converting their NPXS/NPXSXEM tokens to FX tokens. This conversion is NOT mandatory. It’s optional for NPXS and NPXSXEM holders to get f(x) tokens through a conversion process. Conversion rate: It is an open-auction model. The conversion rate per NPXS/NPXSXEM depends on the total contribution of NPXS/NPXSXEM during the period. Less NPXS/NPXSXEM converted within a 24 hour converting session, more FX will be allocated to each NPXS/NPXSXEM on that day. We also have set a daily cap (maximum daily conversion rate) of NPXS & NPXSXEM to be converted. As time has gone by, the maximum conversion rate will slightly increase everyday. See the full details of daily cap of NPXS/NPXSXEM here. Assume 100 FX Tokens are available on Day 1. The convertible cap of the day is 500 NPXS & NPXSXEM. Bob contributes 400 NPXS, Alice contributes 100 NPXSXEM at 10am. The daily cap has reached. Even if Charlie contributes 100 NPXSXEM at 10.01 am, he could not participate. As a total of 500 NPXS and NPXSXEM were contributed for 100 FX Tokens during the period, 1 FX Token will be distributed for every 5 NPXS & NPXSXEM contributed. Therefore, Bob will get 80 FX Tokens and Alice will get 20 FX Tokens. Withdrawal: 12% of FX Tokens will be distributed immediately to the Holder via the XWallet account. The remaining 88% of FX Tokens will be released over a span of 11 months via the XWallet, subject to terms and conditions. The holder will get 8% of the remaining FX token every 30 days. The release date of the FX token is based upon your own conversion date. For example, if A converts on 1 May, he/she will get 12% on 1 May and 8% on 31 May, 8% on 29 Jun, etc. NPXS / NPXSXEM tokens that are converted will also be entitled to the FX staking tokens. However, once the holders convert NPXS/NPXSXEM to FX, they will not able to receive 11.063% NPXS/NPXSXEM monthly unlocked tokens. A step-by-step conversion guide will be available on April 8, 2019. After the f(x) mainnet is launched, all remaining NPXS/NPXSXEM holders will be offered a 1:1 token swap for NPXS-FX/NPXSXEM-FX tokens. *As always, stay alert and never disclose your personal information or your one-time verification code to anyone. Beware of scammers. The team will not contact you directly for sending tokens, offering deals, trouble shooting or system upgrade. Any store can buy, sell, and accept cryptocurrency.